Other Terms: This property is available on a first-come, first-served basis. It can be secured by receipt of a 20% non-refundable deposit. If you are a hunter or fisherman or general outdoor recreationalist, you will want to give this property a look. It is a small island of private land located in a sea of state, federal and private conservation areas, parks and wildlife refuges that total nearly 27,000 acres! With so many wetlands nearby, this area is one of the best in the state for waterfowling and with this much timber in close proximity to irrigated agricultural fields, there is bound to be monster bucks hiding here. 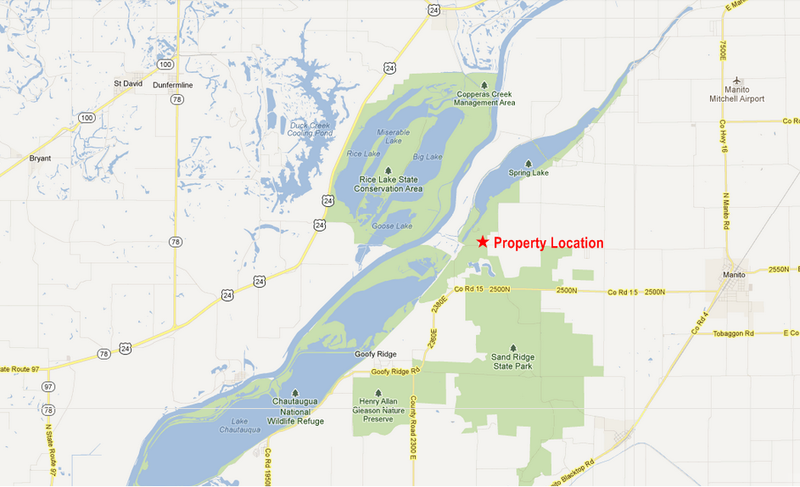 This property is less than 1 mile from the Illinois River. 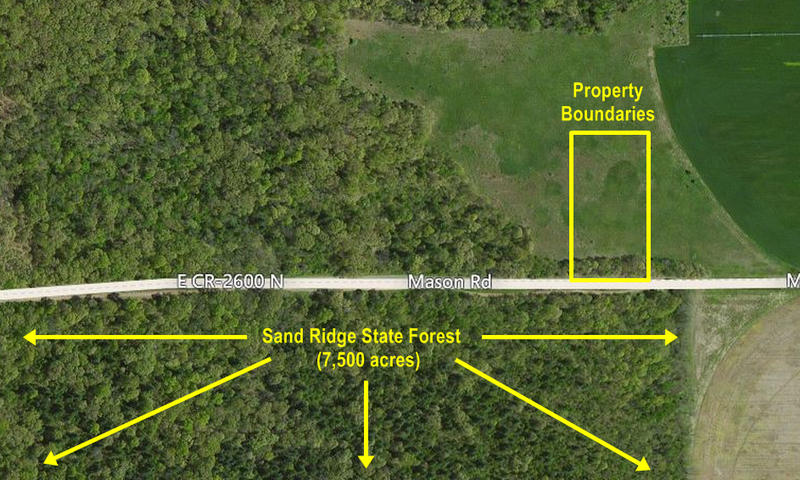 Imagine being able to set up camp on this 2 acre tract and have literally thousands of acres of public hunting, fishing and boating land at your doorstep! This property is surrounded by the Sand Ridge State Forest, the largest state forest in Illinois at 7,500 acres and open to public hunting. 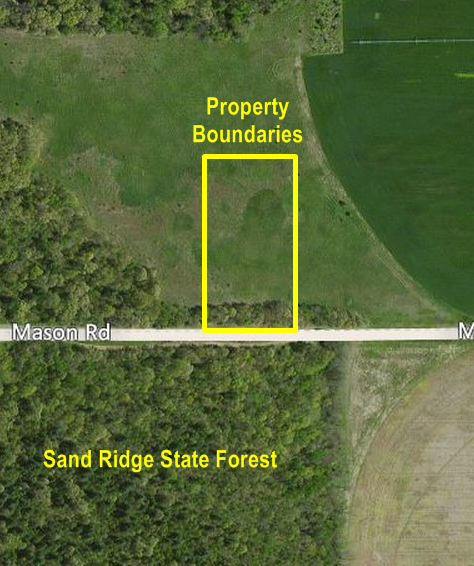 In addition to Sand Ridge, there are 19,180 additional acres of public and private conservation land located within a 10 mile radius of the property. This encompasses Rice Lake State Conservation Area, Spring Lake Fish and Wildlife Area, the Nature Conservancy's Emiquon Preserve and the Chautauqua National Wildlife Refuge! We have assembled a list of websites and information below for each of these areas to aid in your research. This property is the perfect solution for the person looking for a lot of land to hunt and fish but who doesn't want to pay to lease or buy a huge tract of land. With this property, you can literally wake up in the morning and walk across the street or down the road and be on state hunting land! Mason Road (shown in the picture to the right) is the dividing line between Tazewell County and Mason County. You will need to consider this when determining where you want to hunt and where to apply for deer and turkey permits. A boundary survey was completed in mid-July 2012 which confirmed the property's size at 2.0 acres with dimensions of 435.6 feet long by 200.0 feet wide. The four corners are marked with wooden posts and steel rods driven in the ground, so it is clear where the boundary lines are located. Below is a photo album containing pictures of this property and the surrounding area taking in August 2012. For those who think central Illinois is one big corn field, Sand Ridge State Forest will come as a very pleasant surprise. The forest is an island in a sea of agriculture. Just minutes southwest of Peoria, this 7,200-acre, the largest of Illinois' State Forests, boasts sweeping expanses of native oak-hickory, extensive plantations of pine, sprawling open fields, grasslands, and completely unique sand prairies. For a refreshing, invigorating taste of unspoiled nature and an opportunity to experience truly unique environment, Sand Ridge State Forest is ideal. Source: Illinois Department of Natural Resources, (http://dnr.state.il.us/lands/landmgt/parks/r4/sand.htm). The map below shows the location of the property. All of the green regions are public land! The property is at the convergence of a 7,500 state forest and tens of thousands of acres of irrigated agricultural fields! Below is an interactive Google Map, showing a close-up view from the regional map above.